If you want to attend cheerleading camp in the beautiful Poconos Mountains of Pennsylvania, you have a two excellent options to choose from. One of the nation's top cheerleading camps is located in the Poconos. When your squad attends camp in Pennsylvania, you will learn stronger skills and bond together closely as a team. When you attend this camp in the Poconos, you can expect to learn everything from cheerleading safety skills to partner stunts, extreme routines, game day ideas and dances. If this sounds like just the type of camp you want to attend, keep in mind that their overnight camps limit registrations to groups or teams. If you aren't part of a group or team, you will need to look into the commuter camp option instead. Camps are offered to girls between the ages of nine and 18. Fourteen sessions are offered each summer, so share the information with your coach and see if there's a time that your team can attend. Camp Lohikan, also located in the Poconos Mountains, offers a more relaxed opportunity to enhance your cheerleading skills. Camp Lohikan is a general athletic camp, offering camps with a number of different concentrations. One of these concentrations is cheerleading. 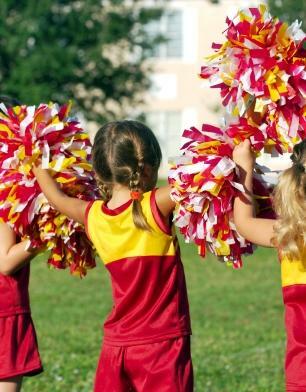 Cheerleaders of all abilities are accepted, and once you arrive at camp, you will be evaluated and placed into a group with other cheerleaders around your age and ability level. If you're not ready for a full-fledged camp, you can attend one of their cheerleading clinics offered in July and August every summer. Whether you attend a camp or a clinic, beginners will cover dancing, basic cheers and jumps, while more advanced cheerleaders will form squads and work on stunts and pyramids. You can attend Camp Lohikan as an individual, so you don't need to worry about rounding up a team. The Poconos Mountains are a beautiful location for camp. Both Camp Lohikan and Pine Forest Cheerleading Camp offer a number of outdoor activities for their campers. You do need to keep in mind, however, that because of the higher elevation, it can get quite cool at night. Make sure you pack a jacket, sweatshirts and sweatpants just in case you get cold. Also, always make sure you have items that will protect you from the sun, like hats, sunscreen and lip balm with SPF in it. Otherwise, attending camp in the Poconos is similar to other cheerleading camps. You'll have a blast and learn new skills while developing a team atmosphere.